Visiting Europe during the holiday season goes hand in hand with visiting a European Christmas market, where you can revel in the season with beautiful decorations, great gift ideas and top-notch local eats. If you’re headed that way, Barceló Hotel Group recommends stopping in the following cities for the top Christmas markets throughout the region. If you want to travel like a local in Prague, which is home to several street markets, be sure to try svarak—mulled wine with cinnamon and cloves—or punc, a kind of punch made with water, sugar, alcohol, lemon and garnishes. If you’re hungry, order the trdelník—a rolled biscuit with sugar and almond flakes which is eaten hot. 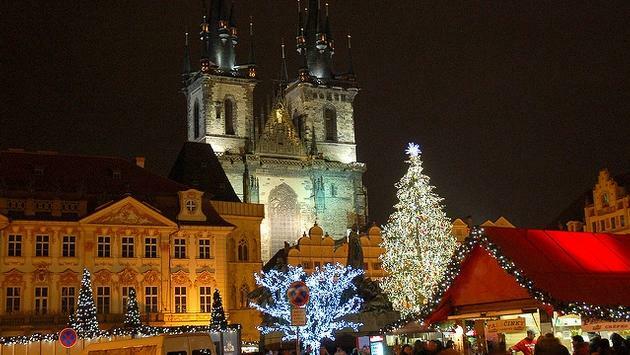 The largest market in Prague is the Old Town Square, which also hosts annual holiday concerts. Or try the markets in Wenceslas Square, Republic Square, Namesti Miru Square and Tylovo Square. There you can pick up glassware, wooden toys, ceramics, craft items, candles and holiday decorations. Italy’s capital is no slouch when it comes to Christmas markets. The top choice is Plaza Novona, located in the center of the city, which also operates year-round as a traditional open-air market. Here you’ll find plenty of befanas—or Epiphany fairies—a popular purchase with locals. This fairy makes the rounds on December 5, leaving presents and sweets in children’s stockings. Other markets can be found in Plaza Mazzini and Plaza Verdi. Also be sure to check out St Peter’s Square, home to the tallest Christmas tree in Rome. While many think of Berlin for holiday markets, the northerly port city of Hamburg also has an impressive selection. Be sure to visit the historic one in the Central Town Square, where you can find some of the best street food in Germany, including sausages, salmon, ham and cakes. Warm up with glühwein—sweet mulled wine—which you can find on nearly every street corner. While there, keep an eye out for Father Christmas, who flies over the market three times a day. Other markets to visit include the Jungfernstieg, where you’ll want to bundle up as there’s a brisk chill coming off the banks of the Alster River. The views are unbeatable! Additional spots include Gerhart-Hauptmann-Platz, Spitalerstraße and Mönckebergstraße. READ MORE: Which Canary Island is Your Pick? In Budapest, Vorosmarty Square market is the top choice for holiday shoppers. Food choices are plentiful—some of the most popular items include Kolbasz (cooked sausages), pecsenye (grilled meat), kenyérlangos (oven-baked bread seasoned with smoked bacon) and langos (deep-fried bread with cheese and toppings). For dessert, grab a bag of kurtoskalacs: Baked dough topped with sugar, cinnamon, nuts or coconut, and then dunked in traditional sweet wine with cinnamon and spices. You’ll also want to check out the advent calendar projected onto the façade of the Gerbaud café, where a new window opens every day. Oher markets can be found in St Stephen’s Basilica, where a light show is projected onto the Basilica. An enormous Christmas tree and an ice-skating rink also make it a must-visit location. The city’s main market unfolds throughout the streets surrounding the Sforzesco castle, and popular items include nativity figures made from a combination of papier-mâché and clay, local craft products, antique furniture and, of course, delicious street food and mulled wine. Read more about these street markets at the Barceló Hotel Group blog, Pin and Travel.